With the increasing costs associated with attending college, more students are turning towards student loans. 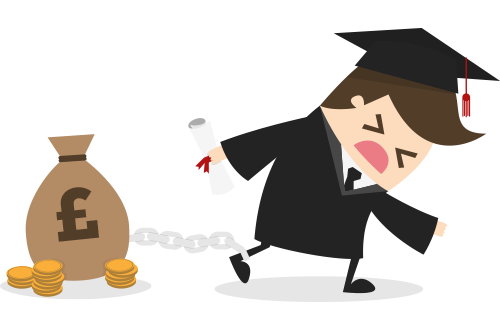 Financing college without borrowing any money can be a challenge today. Fortunately there are several ways in which students can keep their debt under control. Scholarships and grants do not need to be repaid. For students, the best thing to do would be to contact the financial aid office to ask for grants available, fill out the necessary forms and try to get as much grant as possible to reduce the need of depending entirely on student loans. Private loans today offer very low interest rates. However, some of them require students to start making payments as soon as the loan is taken. Federal student loans offer the lowest possible interest rates and have very flexible repayment options. Payments usually do not start until education is completed so they tend to be the better choice for students. For each loan, the grace period would be different so it is important to keep this in mind. For example, Perkins loans have a grace period of 9 months after graduation while Stafford loans have a grace period of 6 months. For private loans, the grace periods vary widely so contact the lender or check the paperwork to ensure you don’t miss the first payment. The interest rate on the loan will determine the amount to be paid in total. Rates may go down or up during the life of a loan and each lender will have different rules on which it will ultimately depend. If you have a lower interest rate, talk to the lender to lock it in when possible. All payments made will first go towards covering the interest and the fees of the loan and not the principal. Try to pay more than the minimum monthly payment required on the loan since it will allow you to lower the principal amount. This will ultimate reduce the interest that has to be paid on the loan. Send a letter along with the payment, asking the lender to apply the extra payment to the principal and not the future payments. Always keep copies of all extra payments sent to ensure they are correctly applied. If you have several different loans, consider paying extra towards the most expensive loan first. Private loans tend to have a higher interest rate so start with those loans. Paying them off ahead of schedule will allow you to save a considerable amount of money in interest. If you have multiple loans that you’re struggling to manage and successfully pay each month, consider consolidating them into a single payment with a fixed rate of interest. There are several advantages and disadvantages of a loan consolidation so weigh them against each other carefully. Look for a fixed low interest rate and carefully read all the terms and conditions. Avoid consolidating federal loans in a private loan since you’ll then lose out on borrower benefits such as loan forgiveness and unemployment deferments. Several different programs will forgive part of or the entire federal student loan for those who work with certain employers or work in specific fields. Federal loan forgiveness programs are usually available for nurses, teachers, those working in public services, nonprofit or government organizations. Private, school and state loan forgiveness programs are also available. If you are facing serious debt issues, do not ignore the problem. Stay in touch with the lender since they can work with you to help you find solutions to your problems. Serious debt problems can lead to several long term, severe consequences and it can also put your co-signer at risk. Consult a debt counselor if you cannot find a solution to your problem.